Cutting the fabric. The lining was cut and sewn first to check the fit. 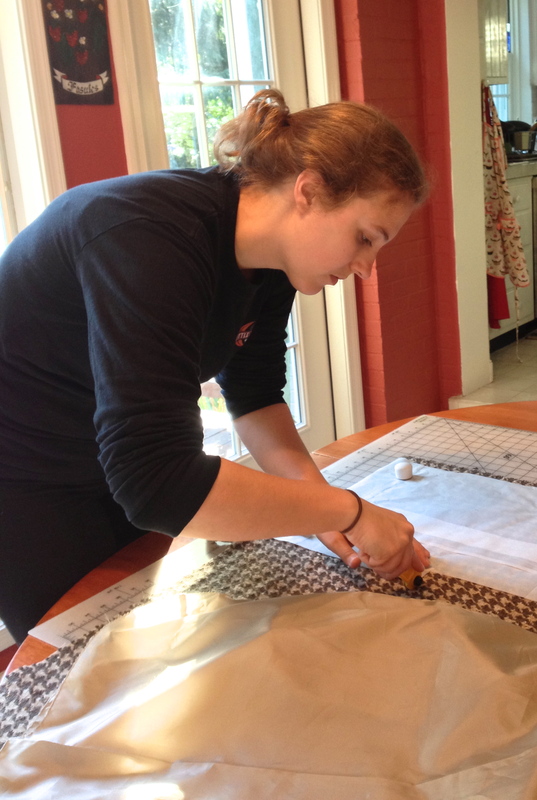 Monday was Columbus Day and Megan had the day off from both school and work and asked if we could have a “sewing day” and make a skirt that she had purchased wool fabric and a pattern for years ago. Luckily we knew where they were! When I was at the fabric store for something else, I saw they had some leather pelts and one was just the color of the fabric for her skirt, so I bought it. I’ve done a little bit of sewing with leather before, but I wasn’t completely confident. At least I had a leather needle for my sewing machine! Here is the pattern she used. Notice the word “EASY!” Not even a dart and we cut the front on the fold of the fabric and so didn’t put a seam down the front either. 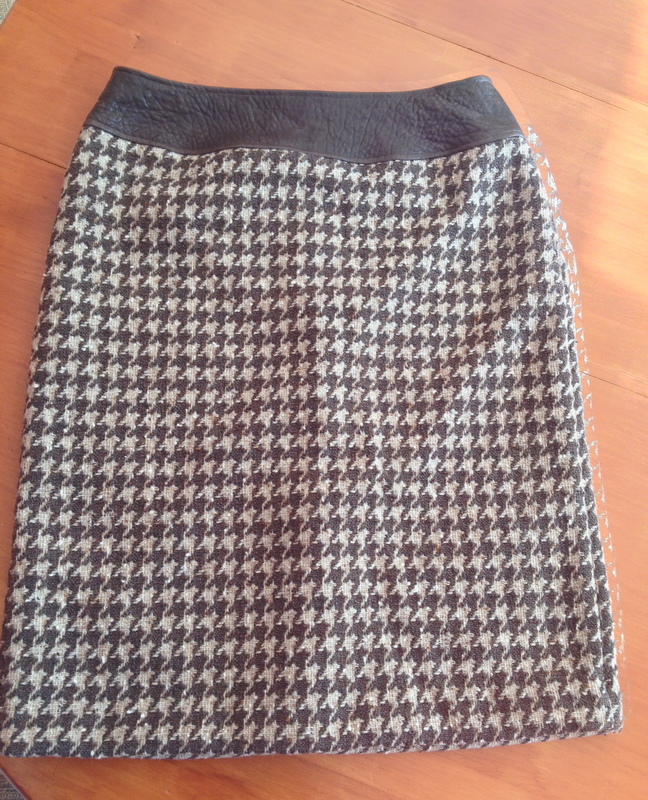 Nothing to mess with the houndstooth pattern of the wool fabric. 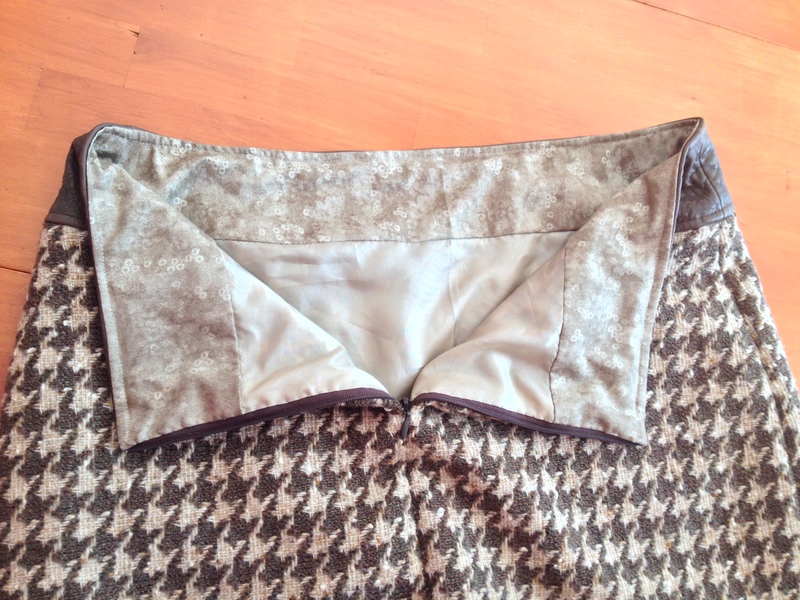 Since both the houndstooth wool and leather were precious, we ended up making two muslins to make absolutely sure we were going to be happy with the fit. The leather was not difficult to work with. This piece was pretty pliable. It wasn’t much different than working with the heavy wool. We were concerned about messing up the zipper but found this blog post that showed an amazing red leather skirt with an invisible zipper in it, so we went for it. We even made the inside as pretty as the outside! All in all, we’re pretty proud of this skirt. Megan did almost all of the sewing but was pretty much hand fed all of the pieces by me as she went. You can not put pins into leather so we used clover binding clips instead. The only other comment I would make about sewing with leather, in case you’re tempted to try it, is that it does stretch and so you do have to be careful of that. 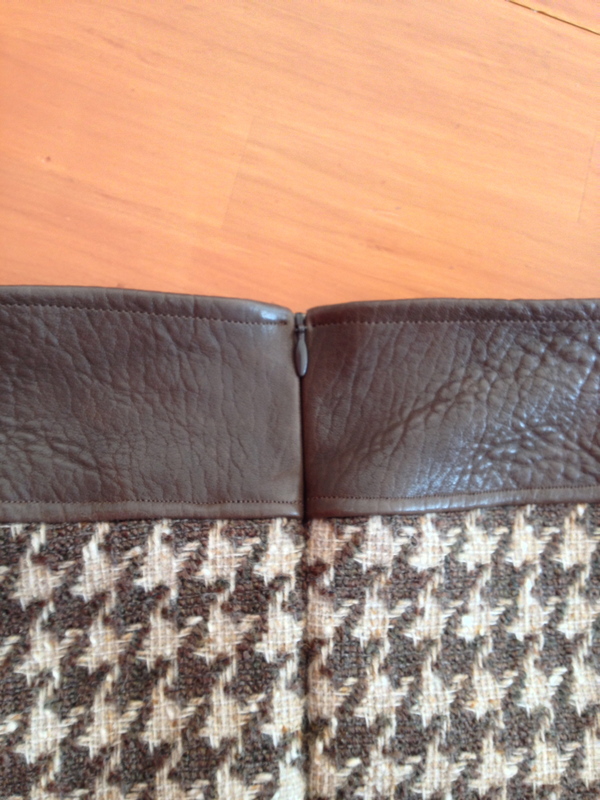 I sewed a piece of twill tape to the upper edge to keep it from stretching as she wears it. Now we just have to wait for the weather to get cold enough for Megan to wear it. What a pretty skirt! I am super impressed you found leather hides at the fabric store. I have to order all of mine online! Finding the hide there was unusual and all of them were pretty small – probably goat or sheep. I have a fair amount left over after only cutting 2 yoke pieces, but there is no way I could have made a whole garment from any of the pieces that they had for sale. They weren’t really of that quality either. 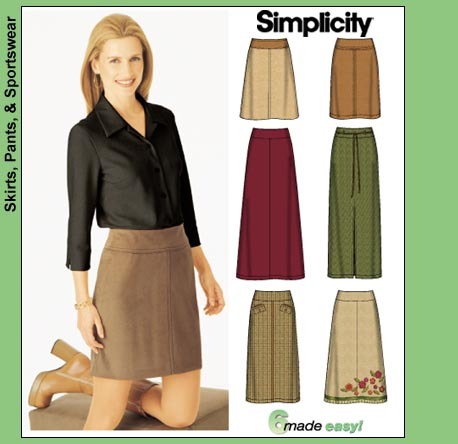 But perfect for this skirt project! That skirt is adorable!! Where is the leather skirt? I did not see a pic of it. Also, I want to see it modeled on the beautiful Megan!! If you click on any of the words that are underlined in the blog post, you will be taken to a link. I didn’t want to use the other blogger’s photo without permission, so I just linked to her blog post instead. I love this skirt! Classic yet unique. The leather waist completely makes the skirt. Meagan and you did a very professional job. Thanks for sharing! Thanks Nancy. I’ll post a picture of Megan in the skirt when I have one. That skirt is gorgeous! I want one! Thanks Jess. I’m sure you could make this easily! Except you’d have to find a different but similar pattern to use. 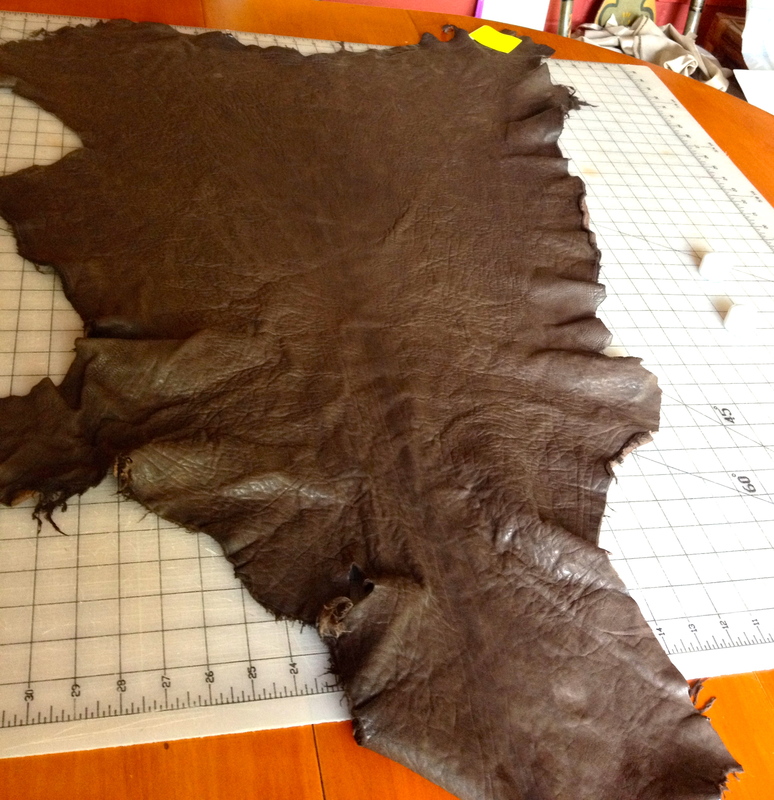 G. St. fabric had the leather hides – many colors just sitting on a table – on 25% off sale over Columbus Day. Maybe not on sale now. This piece was $50 regular price and I have quite a bit leftover which I thought I might use for a bag or bag bottom, zipper pulls, etc… It’s kind of fun to think of what other things I might do with the leftovers. What could be better than sewing with your daughter? I envy your ease with zippers. Must take a zipper lesson with you. I made a special trip just to get that invisible zipper once I determined we could use it. Much easier to install than a regular zipper!